One is an award-winning actress, another a once promising movie director from the 1980s. 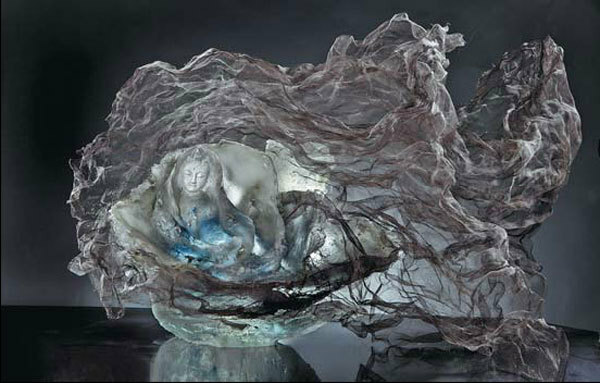 Today, the duo is better known for creating liuli, Chinese glass art works that have a rich yet little known history dating back thousands of years, Chen Jie reports. It began one night in Taipei, in 1984. Chang Yi, 33, sat opposite Loretta Hui-shan Yang, 32, at a dinner hosted by senior director Lee Hsing. Back then, Chang was one of the young directors in Taiwan's New Wave Cinema, who was going to adapt Kenneth Hsien-yung Pai's Madam Yu Ching (Jade Love) into a film, and Yang, was one of the most popular actresses at that time. The other guests at the dinner included several producers and the writer Pai. "He was young, good-looking, did not talk much," Yang remembers. "She was getting all the attention but did not look interested in the movie," Chang recalls. But he remembers her hands because in his mind, the title role Madam Yu Ching - who loses her husband at a young age, secretly and desperately falls in love with another young man and finally kills him before committing suicide when she finds out he has a new lover - must have impressive hands. What Chang did not expect was, years later, the hands would became even more impressive away from the screen, making glass into art as Yang would go from being an award-winning actress to a sculptor. Having that story in mind, my eyes focus on Yang's hands instead of her face as she walks into the room. Before I even scan for signs of aging, she offers her right hand and the firm handshake impresses me. It is this hand that mixes wax with water, tests the temperature of kiln and sculpts the glass into all kinds of shapes. To those under the age of 35, Yang and Chang are known for creating liuli, Chinese crystal glass, rather than as actress and director. 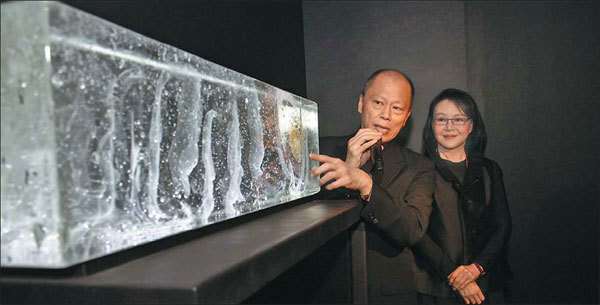 Titled Uncovering Liuli in This Mortal World, their exhibition at the National Art Museum of China will run until May 12. It displays some 50 works in five series, including "A Chinese Liuli Flower", "A Realm Of Zen Within Fire", "Enlightenment", "Free Mind", and "Formless, But Not Without Form". Yang was a student at Providence University in the early 1970s when a TV producer discovered her during a bus trip home. "I never thought I was pretty and my girlhood dream was to be a teacher like my father or a secretary," says Yang, adding that most of the female graduates from Providence University ended up becoming secretaries.